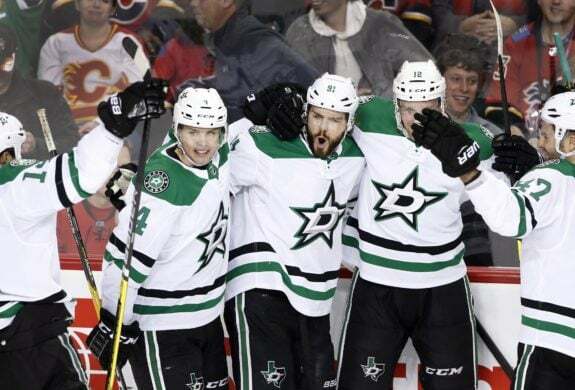 ST. LOUIS — Tyler Seguin scored twice, Ben Bishop made several key saves and the Dallas Stars beat the St. Louis Blues 3-1 on Tuesday night. John Klingberg had a goal for the Stars, who won despite generating only 17 shots on net. Bishop, a St. Louis native, stopped 26 shots against his former team and improved to 5-5-1 versus the Blues. The Stars capitalized on their second shot of the game when Seguin scored at 11:27 of the first period. An unguarded Seguin knocked in a loose rebound that eluded defenceman Carl Gunnarsson just outside of the crease. Dallas had a 5-on-3 opportunity for 1:35 early in the period and made the Blues pay. Klingberg drilled a slap shot from the slot at 1:43 to make it 2-0. The shot went between goalie Jake Allen’s pads for Klingberg’s first goal in 18 games since Oct. 23. Seguin has 17 goals this season. He has six goals and seven points in his last four games. Perron’s 15th of the season gave him a career-high eight-game point streak (four goals, seven assists). NOTES: Blues forward Alexander Steen was placed on injured reserve with a shoulder injury. He played less than three minutes in the first period Monday at Philadelphia. … Blues C Tyler Bozak, who missed Monday’s game with the flu, was scratched. … Dallas forward Valeri Nichushkin played in his 200th NHL game. … The Stars’ first shot on goal came at 10:25 of the first period. … The Blues fell to 25-11-2 in their last 38 games on zero days’ rest.